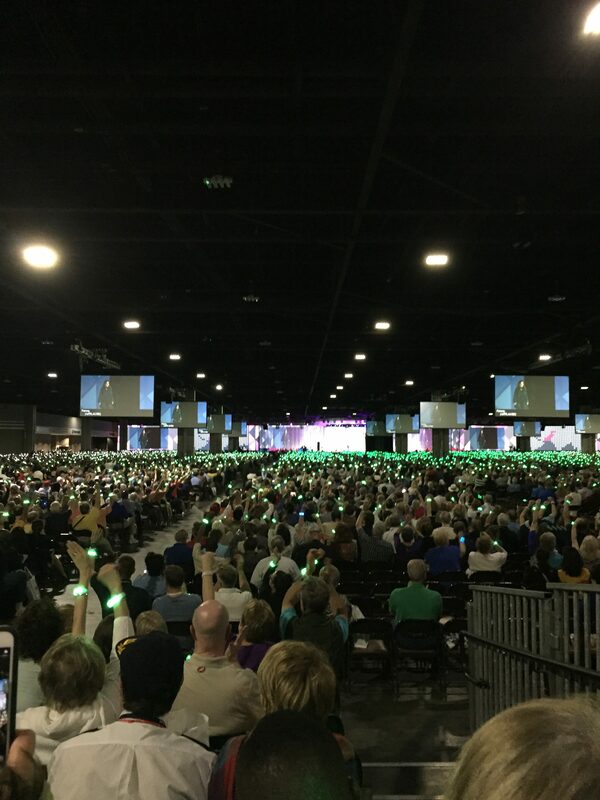 By the time the Peace Assembly and the Presidential Peace Conference were over, I felt like I was getting the hang of things and was ready to be an Ambassador for the Rotary Peace Fellowship at the Rotary International Convention. I made sure I had every thing on my checklist: Suit-coat to combat the frigid air-conditioning of the southern United States? Check. Assortment of Rotary lapel pins? Check. And finally, business cards, the unofficial cryptocurrency of Rotary? Checkmate! I was ready, or so I thought. I don’t think anything could have really prepared someone to behold the spectacle of 20 thousand people moving through a convention center to get to the largest room in the building. Rotarians as far as the eye could see were spilling into the lower level of the center where the general session was held and which officially kicked off the convention. I entered the room in awe and decided to sit in the very back so I could take in the enormity of it all. The session was hosted by Mike Cena, who introduced various speakers from Minda Dentler to Kasim Reed to Bill Gates who, with Rotary President John Germ, announced a two-to-one matching pledge toward the eradication of polio for the next three years for up to 450 million dollars. Since The Bill and Melinda Gates Foundation teamed up with Rotary International in 2007, the two organizations together have fundraised 1.5 Billion dollars toward the eradication of polio worldwide. During his speech, the audience of 22 thousand people was turned into a massive interactive infographic that used the LED bracelets to highlight the achievements of the last ten years. Personally, this was the highlight of the convention for me. It underscored Rotary’s commitment to addressing the structural violence of unequal life opportunities for unvaccinated children and their commitment to using evidence to track their results in achieving that real goal. It was also a visceral experience to be turned into a data point along with 20 thousand other attendees. After the session and for the rest of the convention, I joined the multitude of Rotarians who disbursed and gathered to various break-out sessions where we met and discussed practical ways to advance Rotary’s six causes through collaboration and learning. Memorable sessions were, The Power of Mediation: Local to Global, Rotary and Peace Corps: Partnering to Empower Communities, and Supporting and Facilitating Peace Initiatives. 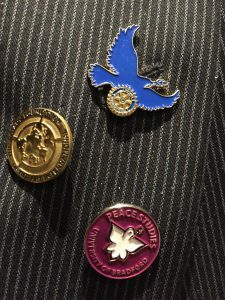 While I won’t take the time to overview these or other sessions like I have for the previous two events, I will say I made plenty of connections of like-minded Rotarians who are dedicated to building more just and peaceful societies through the projects they get involved with at the local Rotary club-level. The cumulation of these new acquaintances and the image of Rotarians flooding the conference center to connect, share, and learn seemed to be an initial realization of Amina J Mohammed’s invitation for Rotary to start an avalanche of leadership in our communities. Upon leaving the convention and setting off on my plane back to the UK, I felt committed to fulfill my part of that avalanche of leadership. I started my applied field experience with two organizations in the UK, Everyday Peace Indicators and International Alert. I split my time between London, Manchester, and Bradford and found the workload consuming but rewarding. I only recently finished my time with these organizations and through the hustle and bustle of the work I almost forgot my commitment to follow up on the inspirations, thoughts, and insights I gained from my time in Atlanta. That is, until I received a letter in the mail, postmarked from the US. 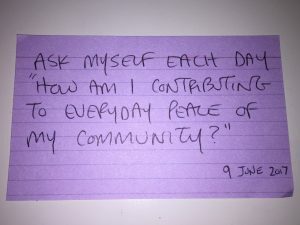 I opened it up and saw a note card, written in my handwriting that said, “Ask myself each day, “How am I contributing to everyday peace of my community?”” [dated 9th of June 2017]. A flood of memories came rushing back to me from Atlanta, including the last exercise of the Presidential Peace Conference when the facilitator David Lamotte, another Rotary Peace Fellow, invited us to write down a commitment that we would make to ourselves in our efforts to sustain peace when we returned back home. The facilitator mentioned he would send the notes to all 100 participants if we included our addresses. I remember my incredulity that he would have the time and the means to do that, but humored the request. After reading my message from the past, I was humbled that I had failed to remember and keep my commitment, but more so that my fellow Rotary Peace Fellow had kept his. It is the small actions like this, and countless others, that Rotarians do every day in their efforts to provide service above self. I consider myself fortunate to be a part of this global network and look forward to taking what I gleaned from the 2017 Rotary Convention in Atlanta, and from my Fellowship more broadly, to contribute to sustaining peace internationally.